A World Bank report entitled "China 2030" (attached below) has pointed to China's liberalization of domestic interest rates as one of the critical reforms needed to transform China into a market-based economy. But the World Bank report also warns that this policy change would need to be gradually phased in. World Bank: - ... after the above institutional and governance structures are in place, the Chinese authorities can also prepare and implement a plan that phases out the ceiling on deposit rates and the floor supporting lending rates; this step will facilitate the commercialization of banks and ensure stability in the financial sector. And as is actually well recognized and understood in China, this final stage of interest rate liberalization will have to be properly sequenced—long-term market instruments first, and short-term deposit rates last. Careful monitoring of the progress of liberalization will be crucial to ensure that banks do not indulge in destabilizing competition that erodes margins or in reckless lending that harms the quality of the loan portfolio, and that any emerging risk of distress is dealt with swiftly. Until recently such reforms have been difficult to achieve. While rates have officially been liberalized, lenders made little differentiation in the spread they were charging various borrowers or other banks. But according to a recent report from Deutsche Bank (DB), this is starting to change. As inflation increased, the PBOC controlled rate on deposits became negative in real terms (sounds familiar?). To service some of the wealthier depositors who demanded better returns, banks started offering "wealth management" products that pay more of a "market" rate (materially above the PBOC benchmark rate). To fund these more expensive deposits China's banks were forced to raise rates on loans. DB: - But by the end of 2011, two-thirds of borrowers were paying above-benchmark interest rates and only 10% were benefitting from below-benchmark rates. 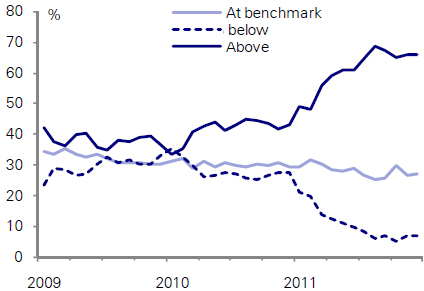 The average interest rate on bank loans was 145bps above the benchmark rate. That is, whereas the PBOC had raised its benchmark interest rate 125bps since the beginning of 2010, the average interest rate on bank loans had actually risen 250bps. Effectively, the higher funding costs faced by the banks at the margin – by having to borrow via “wealth management products” at significantly higher interest rates than the official deposit rates – are being passed on to borrowers. It seems that interest rate liberalization in China is taking shape, all within the last couple of years. It is a positive development indeed, but as with any such rapid transformation, the nation will face challenges. There simply hasn't been the time to carefully orchestrate the steps described in the World Bank report. Here are two key unintended consequences of this rate liberalization that need to be considered. 1. The stronger borrowers in China have recently been tapping the fledgling bond market that according to DB is now RMB4.2tn. They don't want to pay the higher bank rates. This is leaving banks with increasingly risky portfolios of loans as the most credit worthy borrowers use the capital markets for their funding needs - particularly for longer term financing. With bad loans forming a larger portion of credit portfolios, bank capitalization may become an issue. DB: - We contend that it is too late for policymakers to turn back the clock on these developments. Instead, they should act urgently to recapitalize banks so that they can meet the challenges of a more competitive financial system. 2. The other "side effect" of rate liberalization is a further increase in domestic lending rates, as discussed above. The removal of artificially low rates may mean significantly slower growth in the coming years. DB: - At the same time, policymakers and investors should accept that as interest rates onshore rise – possibly doubling in the coming years – domestic rebalancing may mean significantly slower growth as the subsidy on investment is removed.